"Shredded radishes with a splash of olive oil and tamari sauce make a delicious and out-of-the-ordinary side dish or appetizer salad. The tamari sauce takes the 'spice' out of the radish and complements its earthy flavor beautifully. Save the green tops from the radishes for steaming; they're delicious and nutritious." Mix radishes, olive oil, and tamari together in a bowl; garnish with parsley. 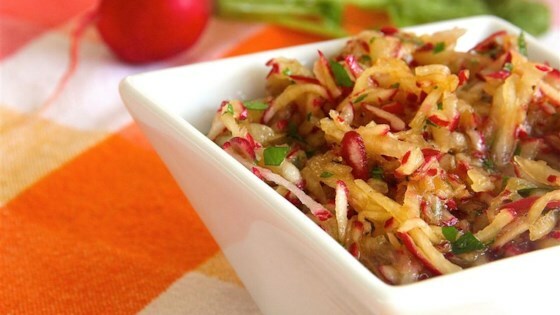 Shred the radishes in a food processor or use a hand grater.